Here are my final 3 favourites and I hope I haven't bored you too much! 7. Sephora by O.P.I in Opening Night - I think this was around $10, I can't really remember, but I bought it in Sephora when I went to America. 8. 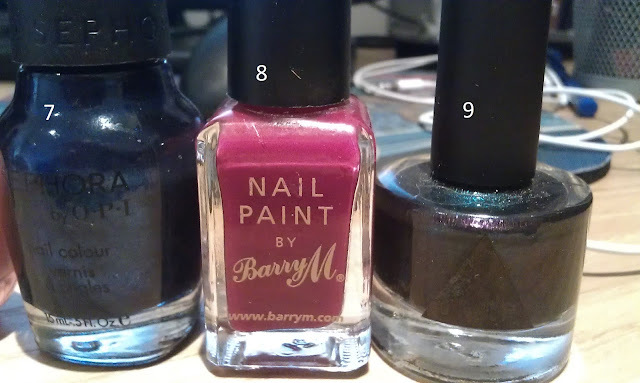 Barry M Nail Paint in Raspberry - £2.99 from Boots, Superdrug etc. I love the colour of this. It is just that perfect warm pinky red, and I just love it. Super cheap price means plenty re-purchases! Needs about 2 coats for full coverage. I would use this as some sort of decoration if I could, I mean the bottle is beautiful and the colour appears to have 20 different shades of green and gold. The colour when it is on isn't as multi-dimensional as it appears in the bottle, but it is still a really nice dark green shimmery colour, and in certain lights, there are purpley tones. 2-3 coats are required for full coverage, so not good, but not bad either. I have all three of these nail varnishes and i love them all too! I love Raspberry by Barry M the most though! Love your blog, How do I follow though?